Controversial NFL quarterback Colin Kaepernick made a "radical chic" fashion choice for a recent television appearance. 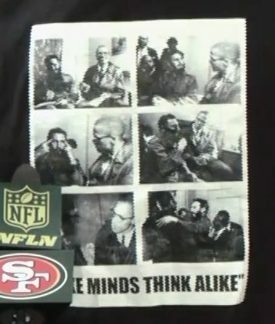 At a press conference, NFL quarterback Colin Kaepernick wore a T-shirt bearing photos of Malcolm X and communist dictator Fidel Castro. Did Colin Kaepernick wear a Malcom X hat and Fidel Castro T-shirt during a recent interview? Outspoken San Francisco 49ers quarterback Colin Kaepernick, who last made headlines by refusing to stand during the playing of the national anthem before an NFL football game, continued to act as a lightning rod for controversy by appearing at a 30 August 2016 press conference wearing a T-shirt emblazoned with photographs of ’60s Nation of Islam leader and black power advocate Malcolm X and Cuban dictator Fidel Castro. According to an article in Slate, the photos adorning Kaepernick’s shirt were taken during an historic September 1960 meeting between Malcolm X and Fidel Castro in Harlem, New York. Some observers, notably Cuban-Americans, have taken Kaepernick to task for expressing tacit approval of Castro, an unrepentant communist dictator whose own human rights record isn’t exactly a shining beacon of liberty. There is no question that racial inequality needs to be a topic of conversation in the United States. But that gets us back to Cuba, where such conversations can get you in prison. My family left there in 1961. We left our home, our furniture, most of valuables and our relatives behind because we were seeking freedom. It wasn’t for money, nor the opportunity to visit Disney and Universal. We wanted to be free, and the United States, bless its soul, gave us that opportunity. So yes, I find it personally insulting that Kaepernick is oblivious to the fact that Castro is one of the most vile dictators of modern times with extensive human rights violations. Contrary to what some sources have claimed, Kaepernick did not discuss his national anthem protest during this press conference. Orlando Sentinel. 30 August 2016. New York Times. 27 August 2016. Fox News Latino. 31 August 2016.